Leaf knife holder (for reusable knife). 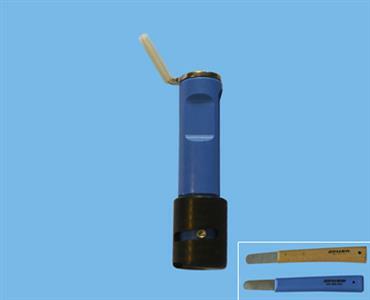 Brinkman’s newest Leaf Knife Holder is the solution to cut leafs. From now on you will make precise and accurate cuts with a clear and neat wound. This will the reduce chance of disease (like for example botrytis). The shape of Brinkman’s leaf knife holder makes it easy and fast to cut leafs, even when the stems of the leafs are thicker. The handle of the knife holder has almost the same shape as the leaf knife and is as thin as possible to provide an optimal grip. The projecting part of the knife holder, the so-called “fruit protector”, has a soft and flexible protective cover, which gives an optimal protection against damaging of the plant and fruits. With the knife holder, it is very easy and quick to replace the knife. Replacing the knife frequently can avoid spreading diseases. After use, the knife can be disinfected, sharpened and reused.